Several components of the College of Education make up our nationally ranked academic programs. 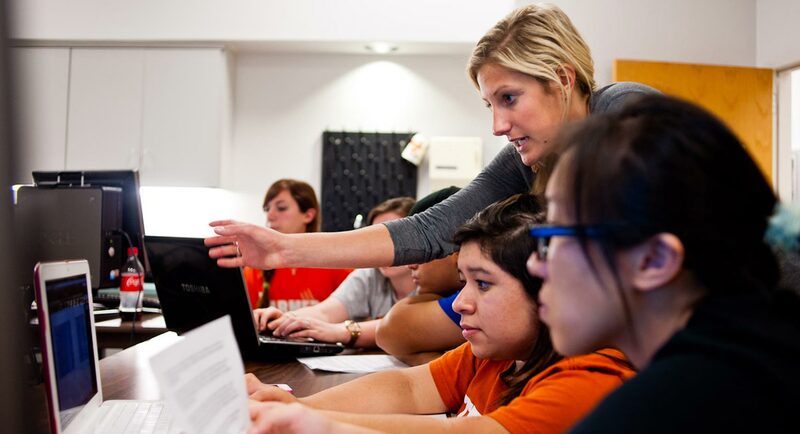 As a Tier One institution, our programs are centered on research-driven approaches to teaching and learning. Students at all levels are encouraged to participate in research projects alongside our expert faculty. The College of Education examines education through several lenses. Our five departments study education from unique and diverse viewpoints: Curriculum and Instruction, Educational Leadership and Policy, Educational Psychology, Kinesiology and Health Education, and Special Education. Teaching and learning often occur outside the classroom, and our students gain skills in leadership, mentorship, advocacy, and research. Like the university, the College of Education shares a deep commitment to diversity and inclusion. We strive to improve the quality and experience of modern education by encouraging the full participation and success of all students in school and life. Each department shares this commitment. Our students learn in and are prepared to create equitable environments that are inclusive of people of all races, ethnicities, languages, socioeconomic and religious backgrounds, abilities, and sexual orientations. In addition, our graduates are prepared to recognize and respond to individual student needs and differences. Our undergraduate majors and minors prepare students to become teachers, health professionals, therapists, coaches, professors, and researchers. Through intensive coursework and field experiences, students become certified in their field to begin their career. Many of our students choose to continue their education with a graduate program that expands their career choices. The College of Education offers postbaccalaureate, master’s, and doctoral programs that allow students to explore in depth the practices that make great teachers and learning environments. Students work closely with faculty to research current social, economic, policy, and health issues that affect teaching and learning within the classroom and beyond. Getting teachers into the classroom is a major function of our college. Our teacher certification programs not only prepare students to take the required certification exams, but also prepare students as classroom and school leaders. We offer teacher certification programs for all levels of students – undergraduate, postbaccalaureate, and graduate. Each certification program involves coursework, scholastic requirements, and enrollment in a Professional Development Sequence (PDS). The PDS includes development courses, internships, and student teaching. Our faculty and students’ research has a real-world impact into the lives of learners, educators, and the community. We use quantitative and qualitative analysis to produce meaningful insights into the ways students learn, and the effect education can have on society. Our college is home to several centers and institutes that expand on educational research. Beyond our courses and research, our college strives to promote education through events, lectures, symposiums, and programs. Many of our events are monthly or annual lectures that feature speakers from our college, or professionals from around the globe.